There many, many good things about Bocca di Lupo. This morning’s delivery of fresh porcini. Our cheerful and funny waiter. A big glass vase on the bar, stacked full of glossy artichokes. The way diners can order small or large portions of every dish, enabling them to try lots of things. Best of all, however, is having lunch at the big marble counter right in front of the kitchen. Eating one delicious dish as you watch the chefs cook your next delicious dish is restaurant heaven for the giddy of mind and greedy of heart. S and I share a plate of crispy fritto di mare - a fresh, sweet tangle of soft shell crab, prawns and squid, each frilled with a tempura-type batter – as our next course is prepared before our eyes. The chef thickly slices a few fat porcini, and sizzles them until they are etched with gold. A chunk of sunshine yellow polenta is heated on the charcoal grill. When both are cooked through and piping hot, they are set on a plate. Gossamer sheets of lardo di Colonnata are laid on top, much in the manner of shrouding the family Chippendales in muslin. The lardo clings and melts to the round caps of mushrooms and the edge of the polenta, leaving a ghostly, salty richness in its wake. The result is whimperingly delicious. This is not really a dish, it is more of an assembly, yet it encapsulates everything that is good about Italian cooking and notable about this new restaurant. Individually, the three elements are of terrific quality. Only someone who understands tradition and proper practice would put them all together. Simple things, done well, sourced well and cooked well, are the cornerstones of culinary excellence. 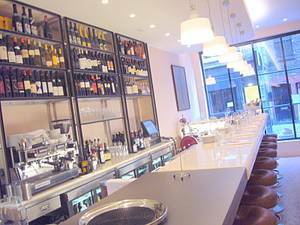 Bocca di Lupo is situated on one of those nowhere streets in Soho . It is a cut-through behind the Windmill theatre, across the road from the headquarters of the Paul Raymond organisation. You could visit Soho for ten years without ever coming across Archer Street , unless you were lost or auditioning to be a stripper or both. The new restaurant is the sprucest thing in the neighbourhood, all tricked out in smart red brickwork, with a big window and a bit of swagger in an unprepossessing location. Inside, a long, carrera marble bar runs down the front part of the restaurant, seating 20 at comfortable, padded bar stools. There is a more formal dining room to the rear, with stacks of plates piled in the centre of each table, bearing testament to the sharing nature of the rather fabulous menu. 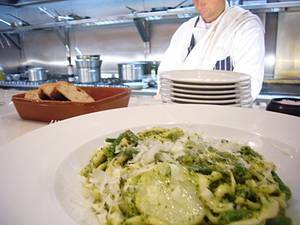 It is strictly Italian, split into sections such as crudi e salumi; fritti; soups and stews; roasts; pastas and risottos and so on. The dishes are not particular to any Italian area, and roam all over the country, with the regionality indicated in brackets. Thus you have fritto di mare ( Venice ) and the lovely polenta and porcini assembly (Lombardy), or perhaps pork and foie gras sausages with grano sarraceno – whole buckwheat - (Trentino) and treviso, rocket and almond salad with amarone dressing ( Veneto ). What can I tell you? The food here is tremendous. On two visits, S and I eat so much it’s almost embarrassing. Yet it’s hard not to, when you can order a raft of little dishes, costing about £6 each, on average, from such an exciting menu. Everything – apart from one sea bass dish, which is a little over cooked but still flavourful – is fresh, clever, nicely executed and well thought out. A salad of shaved radishes with celeriac, pecorino, pomegranate and truffle dressing ( Umbria ) is refreshing and clean cut. A bowl of troifie (Genoa) is the real deal; hand made twisted pasta dressed with pesto, crunchy green beans and slices of boiled potato It is, says S, who used to live there, the most authentic version he has had since leaving the city. ‘The best thing to come out of Genoa since Christopher Columbus,’ he say, but I think he is being modest. Bocca di Lupo do a terrific take on tuna tartare, mixing a dice of fresh tuna with orange zest, capers and roasted pine nuts in a way that does Sicily proud. 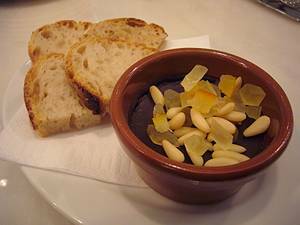 Puddings include proper Sicilian cassata, a brioche sandwich of hazelnut, pistachio and almond ice cream straight from the streets of Naples and – here comes the attitude dish – something called sanguinaccio; a sweet pate made of pigs blood and chocolate, studded with squares of candied orange, lemon and pine nuts (Abruzzo). It tastes like maltreated, sour chocolate - perhaps a treat only for the chocoholics of a vampiric bent. Whether he is going to stay or not, Bocca di Lupo is still a terrific restaurant; a great idea, winningly executed and a boon for the West End theatre crowd. Try to sit at the bar rather than the dining room; it is more fun and atmospheric. Try as much of the fabulous food as you can; it is not expensive. Most of all, try to get here before it is impossible to get a table. P.S. The wine list is also refreshing; sensibly composed with 20 Italians by the glass from £2.40 to £7.50 for 125ml. There are 15 wines by carafe (500ml), priced from £8.60 to £31.30. All appear to be kept and served well. The citrusy Sicilian white grape Grecanico from Castelmonte is a decent, everyday match for fish at £2.90 per glass. Or try the blackcurrant tones of the Negroamaro grape from Puglia, £3.10 per glass, for the more robust dishes. Bocca Di Lupo, 12 Archer Street , London W1D 7BB . Tel: 020 7734 2223. Lunch or dinner for two, excluding drinks and service, £50. One dish meals available at lunch and early evening, around £8.50.